Beta cell failure in pancreatic islets of Langerhans and insulin resistance at peripheral tissues are the two critical landmarks in the development of type 2 diabetes mellitus (T2D). This disease in experimental animals and humans is associated with reductions in antioxidants such as ascorbic acid and glutathione, suggesting the critical role of oxidative stress in its pathogenesis. In this line, dietary antioxidant compounds could show a protective role against T2D onset and development. This point has been recently demonstrated by experts at ICTAN, affiliated to CSIC. 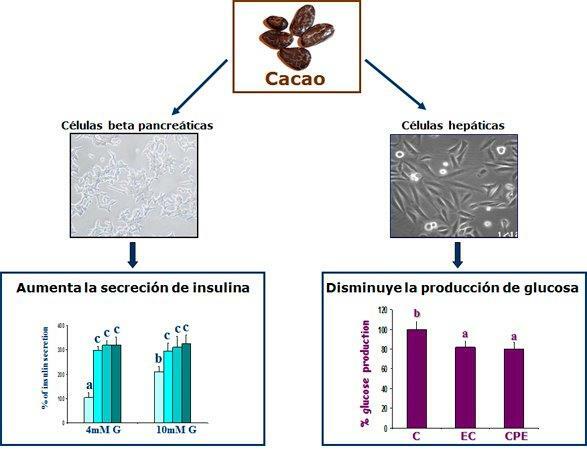 The group of Metabolism and Bioactivity of Phytochemicals at the Department of Metabolism and Nutrition has shown the contribution of cocoa polyphenols to the prevention of T2D and revealed some of the main molecular mechanisms involved in this chemopreventive effect. Cocoa flavonoids improve the antioxidant defense system in cultured pancreatic beta cells and protect them against an induced oxidative stress challenge preserving the insulin secretory machinery. 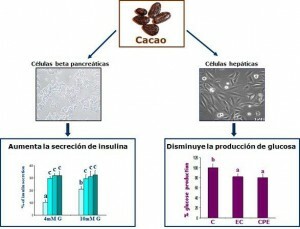 Moreover, cocoa flavonoids improve insulin responsiveness in cultured liver cells by regulating key proteins of the insulin signaling pathway and glucose production cascade. Martín, M.A. et al. Mol. Nutr. Food Res. 2014, 58: 447-456. Cordero-Herrera, I. et al., Mol. Nutr. Food Res. 2013, 57: 974-985.